Some of our Border Leicester locks are up to 8 inches long. Our carding machine does not like them that long. So, I needed to come up with an alternative for these fleeces. 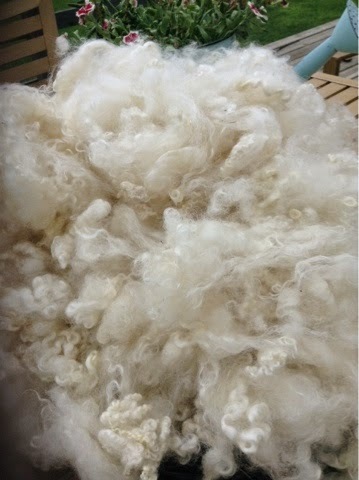 I started with a 10 pound white Border Leicester fleece, one with up to eight inch locks. I layed out some towels, and started sorting the locks. (Great time to put in your favorite movie). Washing the locks came next. It was a little more time consuming than how we normally wash our fleeces. I filled the sink with hot water, just enough to cover the locks. I then, set the locks out in a single layer, and soaked them for 15 minutes. I removed the wool from the sink and gently massaged the wool wash into the locks. I changed the water out, and placed the locks back into the sink, and set the timer for another 15 minutes. I repeated the soap and rinse cycle twice. I laid them out to dry. 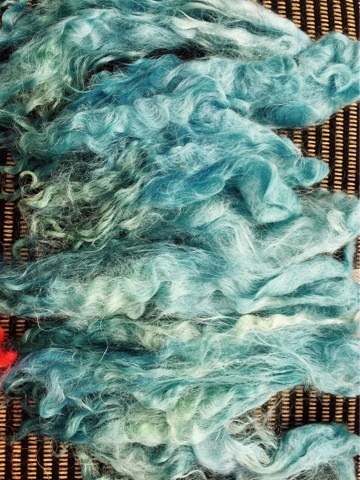 This fleece had some discolored tips, so I decided to dye them. 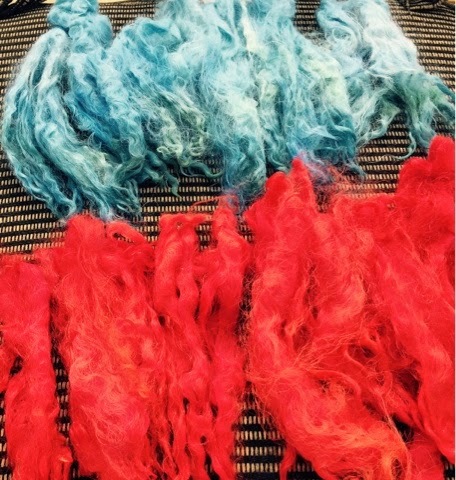 I have dyed larger amounts of locks using the kettle technique, locks that were later carded into roving, so if they were a little disheveled/tangled, it didn't matter. After reading some tutorials, I decided to try the method of dyeing that uses a microwave to obtain the heat needed to set the dye. I was more than happy to give up my old microwave to the dye studio, once used for dyeing, it cannot be used again for kitchen use. The microwave method is quick, much quicker than the kettle dyed method. It is great for small quantities. 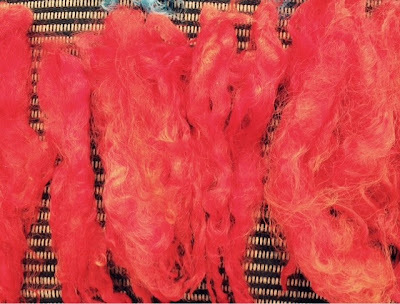 I dyed about 2 ounces at one time, One batch with Robin Eggs Blue and another with Salmon. I love the shade of blue, but dissapointed that it didn't hide the discolored tips as well as I would have liked. They look a little green. The Salmon, turned out bright, and dark enough to hide the discolored tips. I decided that I need to order more dye colors... I have a LOT of locks. I may try hand painting the next batch. It's very interesting seeing all of the different techniques you are using in the dying process. I look forward to seeing the painted version. What are you going to make from these locks? I may try spinning from the locks or other spinning techniques using locks. Some of the locks may make it into the Etsy Shop as well. Cushing Dyes-Robin Eggs Blue is one of my favorite colors. The other is a Jacquard dye-Salmon. I have noticed that Jacquard have several colors that seem to be mislabeled. But in this instance, I still like the color, even if it is not what I picture Salmon to be. 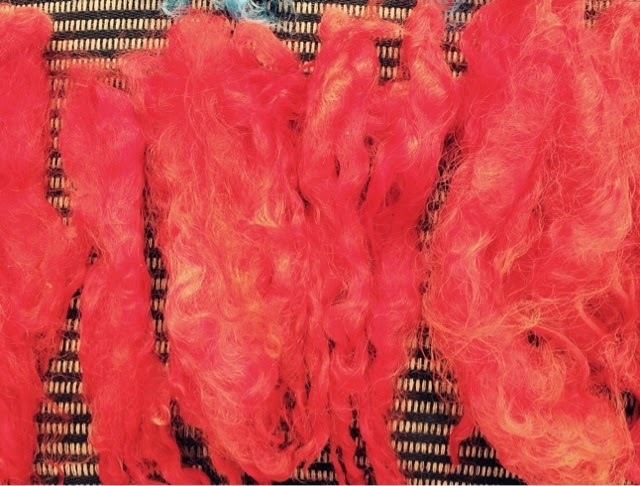 Beautiful fleece, beautiful locks! 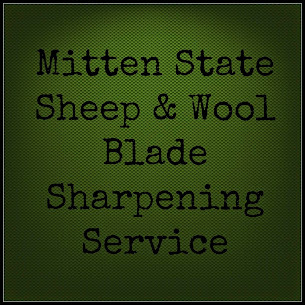 There are several fun ways you could spin them, from the lock, from the fold, or even cut them. I love the colors you chose. Dying is so much fun! I am going to try to spin them. Core spinning looks interesting! Who knew you could use an old microwave for that! The salmon color is just beautiful! It all looks so soft, I just want to run my fingers through it. lol.. The colors are just stunning!